Flamingo Candles Rose & Marshmallow scented candle – £12.00. I LOVE Flamingo Candles, after stocking up on their winter scents in the sale – and I still have a couple of those candles left – I was completely ready for some fresh new spring scents, and then Flamingo happen to announce their brand new Spring collection, perfect timing! There are six fresh new scents availing now ranging from Raspberry & Salted Caramel to Green Apples – and I have Rose & Marshmallow, which is a beautiful light and sweet scent. I can imagine it won’t last me very long! Lime Crime Velvetine Liquid Lipstick in Cashmere. I’ve been a big fan of Lime Crime’s Velvetines since they were released many moons ago (You can see my very old review of Pink Velvet here) Cashmere happens to be the shade on everyone’s want list at the moment though, it’s kind of a beige with a hint of grey – greige maybe? Anyway, I thought it was either going to look awesome, or give me ‘dead’ lips. Either way I really wanted it and ended up paying over the odds on ebay as it’s constantly sold out. 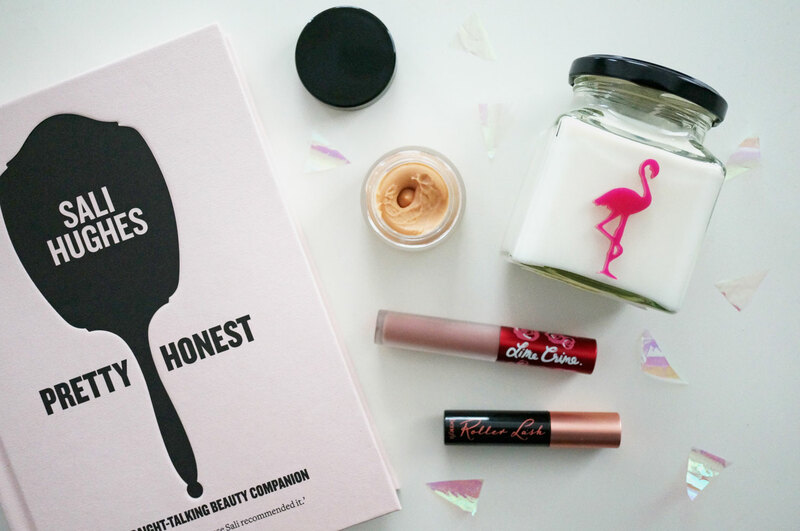 (Also, there have been quite a few problems with Lime Crime lately, you should read about the recent hacking scandal if you haven’t already) So I wouldn’t have bought from their site anyway. So, it turns out Cashmere is actually an awesome colour, it’s really unusual and didn’t give me dead lips after all! I’ll have a full post coming up on it shortly. BD Trade Secrets Flawless Primer – £9.99. BD Trade Secrets is the brand new and re-vamped Barbara Daly range which is exclusive to Tesco. To be honest, ‘Barbara Daly’ wasn’t that appealing as a brand, but BD, along with the name has also had a formula re-vamp across the range. I’ve tried a few BD products out and so far and the stand out one for me has definitely been the Flawless Primer. It has a thick silicone gel type texture and does a fantastic job of ‘filling in’ my face and creating a super smooth makeup base. And lastly, Pretty Honest By Sali Hughes – £14.96. I got this book for Christmas, and I’m sad to say that I’ve just been so busy, I haven’t had time to just sit down and read it properly. But the good thing about this book, is it’s super easy to pick up and read snippets and sections whenever you feel like it, which is exactly what I’ve been doing. Sali is just the most amazing beauty guru, there isn’t anything she doesn’t know and it’s all in this book. If you’re a makeup, skincare or general beauty fanatic like me, this is your bible and you need to purchase a copy now! I’d love to hear if you’ve tried any of these products? Or what you’ve been loving lately? I love the sound of the rose and marshmallow candle….and the jar is so sweet!